On Monday, March 12, 2018 we will meet at Jackie’s lovely home in Historic Indian Village*. At 7:00pm we will enjoy refreshments, including wine, and meeting and greeting each other. We will have a brief business meeting at 7:30pm. News about the Home & Garden Tour on June 9 and 10, 2018 and the April Pancake Breakfast will be discussed. Program starts at 8:00pm with our speaker Malik Yakini of D-Town Farms. 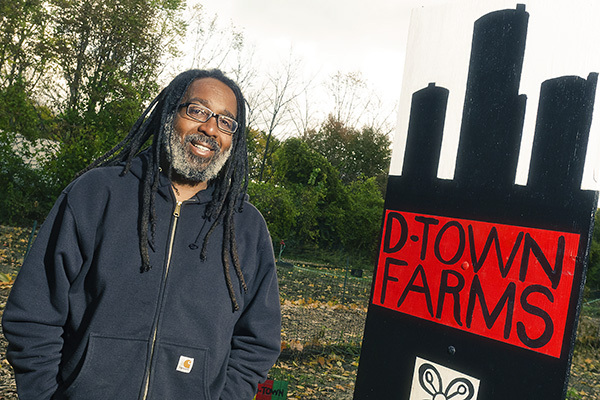 In addition to news about his westside urban farm, he will talk about Detroit Black Community Food Security Network (DBCFSN) which works towards establishing food justice and food sovereignty in Detroit. The Network is guided by the understanding that access to good, clean, sustainable grown food is a basic human right. Prospective members and guests are always welcome. For more information: <kathleenkrasity@yahoo.com>. *Members, check your March email meeting notice for more information. Like Historic Indian Village? Spread the word about our great community!